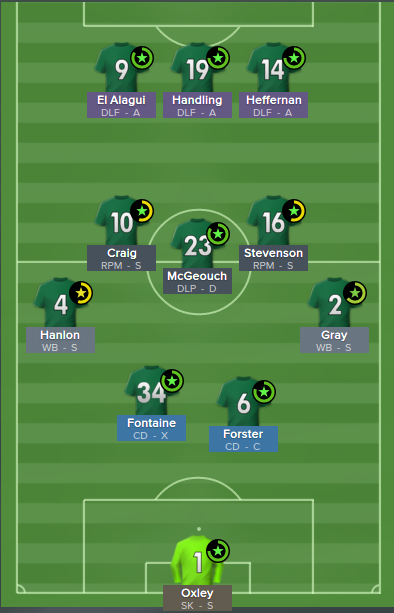 After winning the Premier League with Newcastle Utd in my first season, I have decided by popular demand to be Hibernian, I am going to apply the same Follia v.1 formation. I haven't managed in Scotland before, and I rarely manage outside of the topflight, so this could be quite a challenge. That is once they are promoted, I expect that Hibs will be fairly strong in the second tier of Scottish football, so we've got a transfer budget of £120,000. I'm not used to these size transfer budgets, I think I'll save the money and rely more on our youth system to build success, I hear Hibernian have a fairly good youth recruitment rating on Football Manager 2015. Our first signing is Pascal Feindouno, he was available as a free agent and I thought we could do with another option upfront, his technicals don't look bad for a player at this level. I will be re-training him as a deep-lying forward (attack) to fit in with the formation, I now have my first competitive game as manager of Hibernian, we are at home against Queen Of The South in the Scottish League Challenge Cup. This is the screenshot of my formation and lineup. Well we won, we're through to the next round after a 2-1 win over Queen Of The South, goals came from Paul Heffernan and Danny Handling. 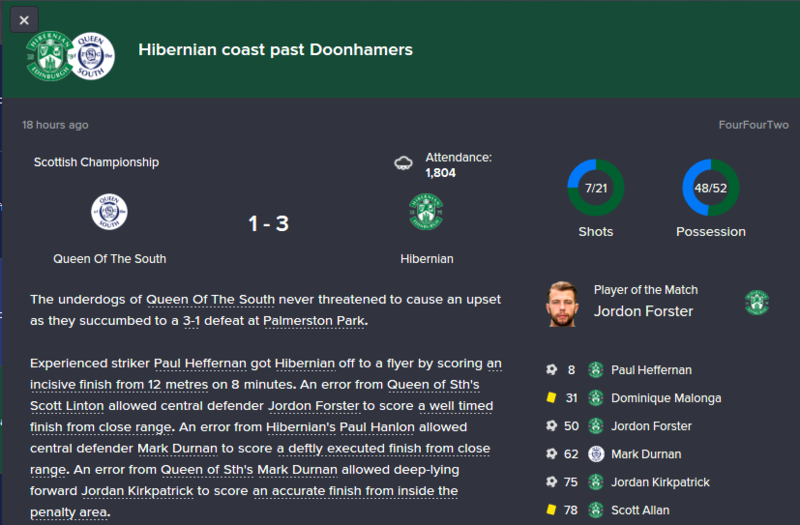 It would have been 2-0 but James Fowler scored in the very last moment of the game for Queen of the South, our first league game of the season is at home to Livingston, can we start the season with a victory? Well that didn't got to plan, we got Dylan McGeouch sent off in the first half, I'm not really sure if Livingston are good or not. We fielded a reserve team for the second round of the Challenge Cup, and were knocked out away to Morton, our next game away to Hearts could be one of our biggest games of the season. We win 5-4, what a game that was, Liam Craig gets a hat-trick for Hibs. I think we did really well to win against tougher opposition away from home, hopefully this is a sin of things to come. Great result away at Alloa, Dominique Malonga with the hat-trick and Liam Craig adding another 2 to his tally for the season which now stands at 5 goals in 4 league appearances, I will give a league standings update when we are roughly a quarter into the season. We have just completed the signing of Keaghan Jacobs from Livingston for £26.5k, he has covered a lot of distance in games so far this season, we need players who are going get stuck in. I'm looking to see if we can bring in one additional signing before the summer transfer window closes, because I don't have too much experience at this level I have decided to let the managing director sign players too, which means we now have two heads looking for players. I have the final say whether the transfers go through. We have just completed our final two signings of the summer transfer window, they are Darnell Fisher on loan from Celtic and the permanent signing of Jordan Kirkpatrick from Dumbarton for £46k, hopefully this will strengthen our squad. We beat Rangers away, what a result that is, I think that they are the team with the most resources out of our division. If we keep going hopefully we can be back in the top division next year, the Scottish Championship only has one automatic promotion place and three play-off places, at this stage Rangers, Falkirk, Hibernian, Hearts and Raith appear to be peeling away from the rest of the pack. We are at home to 1st place Raith next, so we have a chance to take top position. We won comfortably in the end, Liam Craig has been on fire all season, we go second on joint points with Hearts. 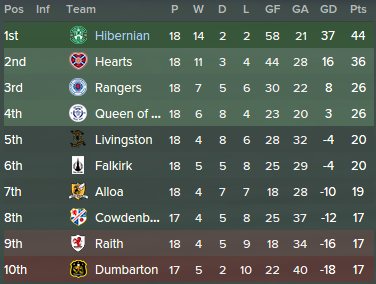 Well this is the table update as promised I think we are roughly one quarter of the way through the season, as you can see Hearts have been amazing scoring 25 goals in just 9 games, it will be a real challenge for us to gain automatic promotion. I thought Rangers would be the biggest challenge but they seem to have dropped of a little at this stage of the season, other than that I think the current top 4 could well remain intact come the end of the season, in which order they finish is the big question. The big game is coming up, 2nd v 1st, it's Hibernian v Hearts. Both teams are now level on 22 points after 10 games. 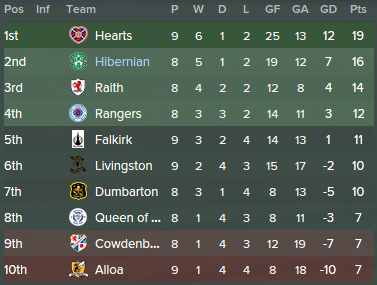 We have now won on the 2 occasions that we've played Hearts in the league this season, I think the Follia v.1 tactic is proving to be a success again, i worked with Newcastle and is working very well with Hibernian. We now are top of the league by 3 points after 11 games played in the season. We are upto the halfway point of the season now, and are a long way ahead already, we have a 8 point lead. And look how many goals we've scored, 58 in 18 games, we've been free scoring. We are a staggering 24 points inside our minimum expectation for the season, that is to qualify for the play-offs, point gaps have started to open up between the top 3 teams in the division. I would rather not go through the stress and unpredictability of trying to get promoted via the play-off system, it is something I've never really been a fan of, below is a screenshot of some of the amazing results we've managed to achieve in the league this season. We have won our last 6 games, and haven't lost for sometime now in the league, we did lose to Inverness CT from the Scottish Premier League. It should be mentioned that we have a policy of playing a fully rotated selection in cup competitions, the only questionable results come at the start of the season, which I think is down to the players adapting to the tactic in training. Another win for Hibernian, we now sit 8 points clear at the top after 22 games, next season the real challenge begins.